You can spend anywhere from a $350 point and shoot to a $40,000 digital medium format to shoot food. 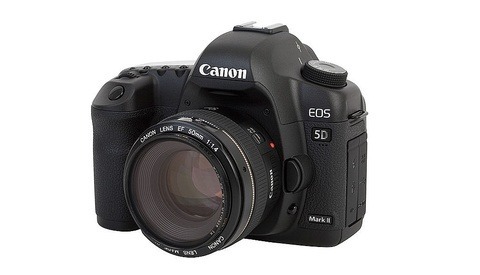 I use a Canon 5D Mark II, but you can use any body that you are most comfortable with. I prefer using a DSLR and taking advantage of the many available lenses. Both full frame and cropped sensor bodies will yield excellent results. Food doesn't move, so the number of auto focus points or the number of images captured in burst mode aren't that important. I prefer to shoot with full frame bodies like the Canon 5D Mark III or Canon 6D. For Nikon shooters, try the D800. I let the subject dictate which lens I use. I have found that to shoot food, there are three focal length ranges that I always keep in my bag. I will use a wide angled lens like the Canon 17-40mm for large table spreads, restaurant interiors, or landscape style shots of fields or orchards. If you are shooting on a Nikon body, try the 16-35mm. I use a normal length lens like the 50mm f/1.4 for for smaller table spreads with several plates. If you are shooting with a cropped sensor, you may find that a 35mm lens will work better for you. For Nikon shooters, try this 50mm or this 35mm. The lens that I always use when on a food shoot is one with macro capabilities. Here is an article that goes further in depth about why I love macro for food shots. For Canon shooters, try the Canon 100 mm macro lens with IS. For Nikon Shooters, give the 105mm a try. If you have the budget, the Zeiss 100mm is an amazing lens. If you are shooting on a cropped sensor, the 60mm Macro will give you a similar result. 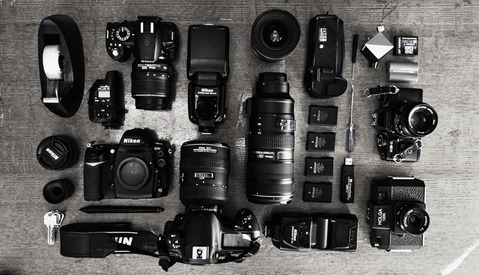 If space is a concern, the Canon 24-70mm or Nikon 24-70mm is a great one lens solution that will shoot both large food spreads and close up images of plated dishes. For the advanced photographer, I recommend the 90mm TS. The tilting ability will allow you to focus in ways that you couldn’t achieve otherwise. This lens only focuses manually, so I wouldn’t recommend it for a beginner. If you have the budget and the time, you can create stunning and unique images! With my food photography, I always try to achieve a natural lighting look. If a large window isn’t available, I will use a single artificial light source. If you are shooting on location and the size and weight of your gear is important, I recommend a compact battery powered flash like the Canon 600EX-RT or Nikon SB 910. 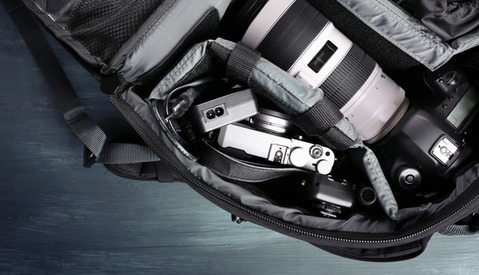 Pairing your flash with a pair of pocket wizards will allow you to work without tripping over any cords. 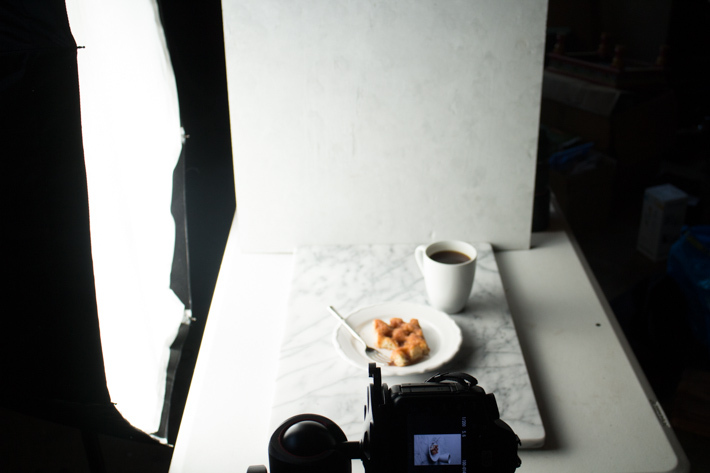 If you are planning on adding video to your food shooting and want a continuous light solution, check out the Lowel Tota. It's bright enough to take beautiful images of plated dishes at night. Its bulb will reach high temperatures, so I don’t recommend using it in crowded restaurants or in other situations where there is a chance it could be knocked over. For larger sets that require a lot of light, I will use a monoblock strobe unit like the Profoto D1 Air. 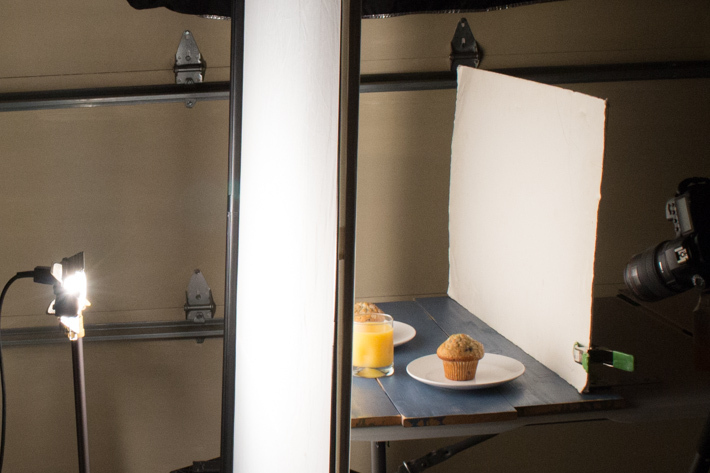 To create a soft, directional, and natural light look, I use large lighting modifiers. There are a wide variety of modifiers on the market that you can choose from. If you shoot with studio strobes, a 36x48 sofbox will create a large soft light source for you to shoot with. Below are two of my favorite modifiers that I always bring with me. When I am shooting with a small battery powered flash, my favorite lighting modifier to use is the Wescott 43" Apollo Orb. It's lightweight, portable, and offers me a wide range to lighting looks. You can shoot through the diffusion material, reflect off the inside silver lining without diffusion, or reflect of the lining and through diffusion. This lighting modifier never leaves my bag. Below is a set-up shot showing the Apollo Orb in use. If you are using the Lowel Tota or need to soften light from a window, a medium or large scrim Jim with diffusion material is something you should have! Place the scrim between the light source and your set, and you will have beautiful soft light fall over your set! Keep in mind, the Tota gets really hot! To prevent an accident, don't place it too close to the scrim. If you are working in a smaller area, a collapsible diffuser is a great item to soften your light. Below is a set-up with the Scrim Jim and the Tota. Here are a few items that will make your food shooting easier. A sturdy Tripod and Head will help ensure sharp images. I use this Induro Alloy 8M AT214 with a Manfrotto 055 Head for my food shoots. For complex overhead shots I attach a Manfrotto 131D Side Arm to the tripod. This allows me to keep the camera in the same overhead position as I make minor styling changes to the set. A remote release allows will let you move around set without having to be behind your camera to capture an image. These $5 fixes will help you with your food styling. Whether you are just starting out or are an experienced pro, you may already own a lot of this gear. 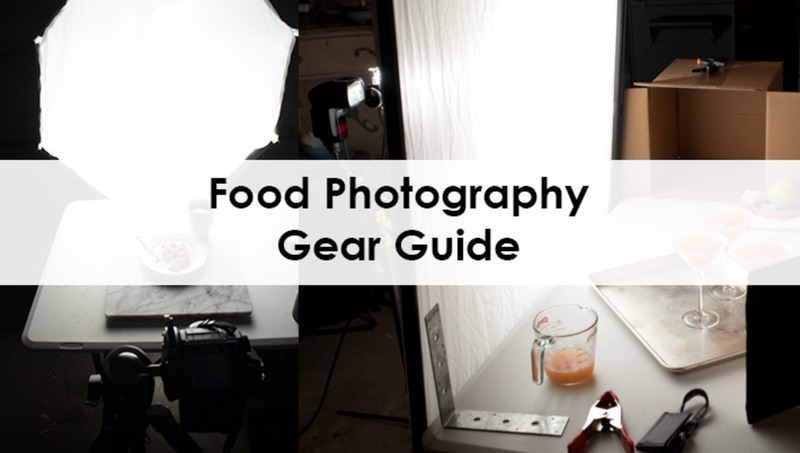 To learn how to use this gear to take beautiful pictures of food, check out issues 1-8 of photographing FOOD available for download in the Fstoppers Store. If you want to see how photographing FOOD can help improve your food photography, check out this review of the series. Do you shoot with the 90mm TS often? Do you talk about it in any of your e-books? Thanks! Hope you are enjoying photographing FOOD! I have rented and shot with the 90mm TS a couple of times and love it! I'm waiting to see if the rumor about a new version coming out in 2014 is true before buying one. I don't go into using it in current issues of photographing FOOD, but I will be discussing its use in future issues! On an unrelated topic, what's this this damn beam advert.. anybody else find it "a little" intrusive? I mean I don't mind ads, fstoppers has to make their money somehow... but really? It's only for a few days, promise. Dear photoshelter, the more obnoxious your advertisements, the less I want to use your service. To be perfectly honest I never even noticed it until you pointed it out. Does not bother me in the least. Thx! Also checkout 99PhotoTricks website. I understand the need for ads, but does photoshelter really find it necessary to take over the whole page? I think it's too far on their part. I just hope that if fstoppers is going to allow it, they better have gotten a pretty penny. If someone is going with the Canon 600EX-RT flash, I would steer them away from Pocket Wizards. The Canon ST-E3-RT Speedlite Transmitter works excellently with the RT. Pocketwizards are great, but if you're going to buy Pocketwizards, save some money on the flash. Taylor, thank you for your informative posts. Have gotten me totally into a type of photography I wasn't into before. I was curious why you use the Lowel Tota with scrim instead of getting another constant light with a softbox over it to reduce pieces and have everything in one unit?